Housebound. In hindsight it wasn’t the wisest move to use flowers to remind me of the outdoors which, until late, has been a flurry of chestnut pollen and Saharan dust (yes, the desert can reach all the way to Switzerland). I can’t breath out there. 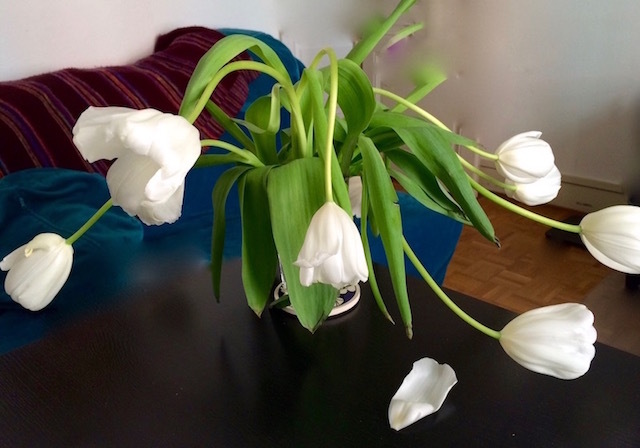 So I sit at my desk and inhale tulip pollen—revenge. But now that May is here, and I have served my time, I pick up the phone. A few things about adulthood confound me. Like why I can no longer show up on Stacy’s porch and ask her if she can come out and play. Why everyone is so busy, but when you ask them what they did, they say “nothing.” Why conversation is about the boyfriend who doesn’t do enough, the co-worker who undermines, the noisy neighbour, inconsistent bowel movements, and goals permanently trapped in the conception stage. Talking it through rarely makes people feel better but it explains the three-hour time slot scheduled a week in advance. Nowadays, relaxation is not a dance party, a pillow fight, a board game or foursquare. Relaxation is turning on the television and watching Kim Kardashian getting a massage. Kids get playgrounds and adults get the coffee shop. And at any given moment, there are six people inside it. They are sitting by themselves watching me write and talk to myself (an unfortunate side effect). Occasionally someone asks to charge their computer in the wall behind me. And so I move to a table next to the men’s bathroom and look like someone who knows the code. I shouldn’t really complain about the fact that my friends are busy. I'm full of life and have the same problem with priorities. A month sequestering was probably a good thing. I'm learning to lead my life instead of manage it. For example, I'm going to need allergy shots or a visit to the chiropractor to prevent this from happening again next year. How does November 23rd, 10:37 sound?